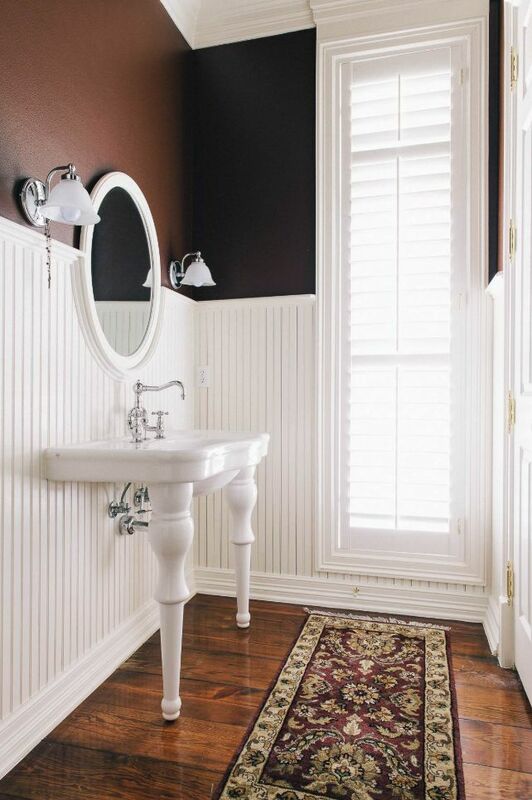 A while ago we talked about bathroom wainscoting and we mentioned that it’s often confused with the beadboard wall treatment. While there are major similarities between these two design techniques, there are also a few key differences which make each style special. Today we’re focusing on beadboard bathroom designs and in particular on some of the particularities of this stylistic choice. We’ll reveal some of the ways in which such designs can add visual interest to a bathroom and some of the ways in which beadboard wall treatments can be installed. As in the case of wainscoting, beadboard wall treatments are known for featuring a traditional look and that’s something one can take advantage of when decorating a bathroom. 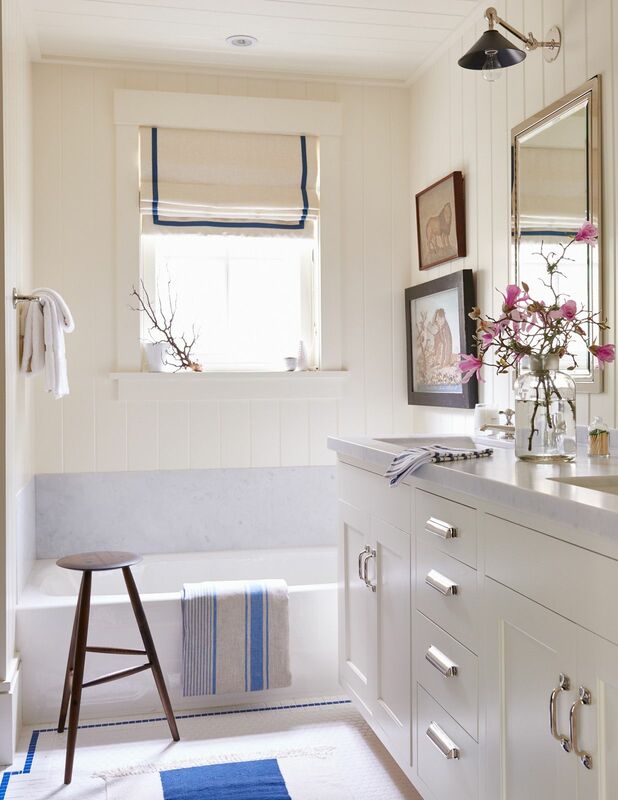 Check out this blue and white bathroom decor featured on Mark D. Sikes. It has just the right amount of minimalism required in a modern homes but at the same time is infused with traditional details. Although the key elements of beadboard wall treatments are typically always the same ones regardless of the details, they’re not the only thing that matters. In fact, it’s the little things and the variations of the design which allow this style to remain beautiful and popular even today. For example, the simple fact that the boards are positioned horizontally on the walls of this bathroom designed by Bill Ingram Architect is enough to make the decor special. Like wainscoting ,a beadboard wall treatment can be installed at any height. 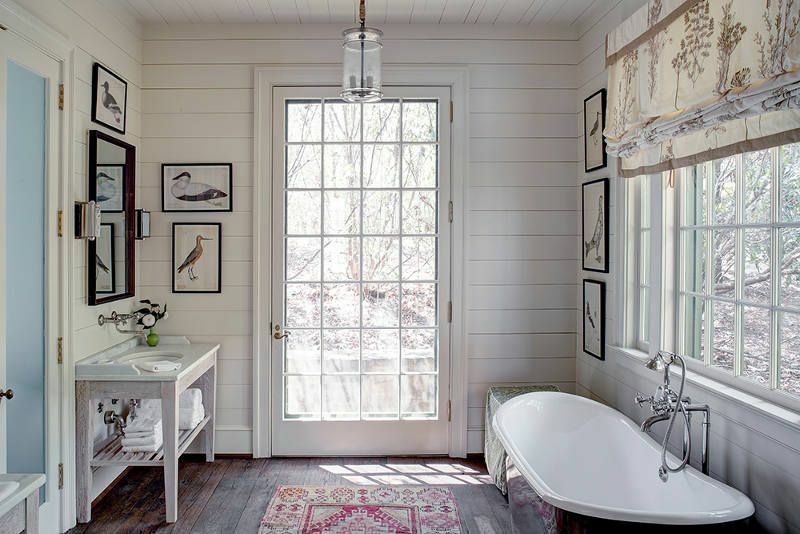 Typically it covers the bottom half of a bathroom wall and contrasts with the upper section, as shown in the bathroom of this cabin designed by Susan Burns. In some contexts the panels go all the way up and end just where the ceiling ornaments begin and that’s reflected in this design as well. 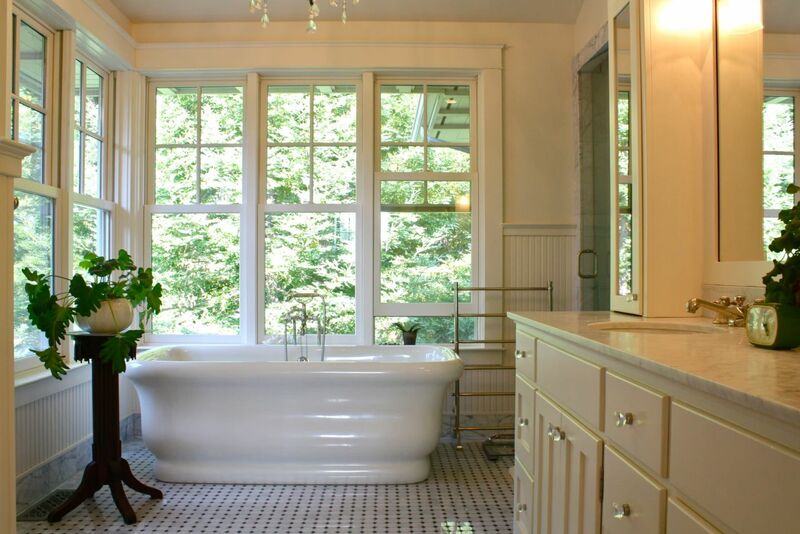 Beadboard bathrooms are known for being extra cozy, welcoming and warm and also for having a certain dose of retro charm. If you’ll check out some of the other spaces in this loft you’ll see that this wall treatment is reiterated into the home in various different ways. Vertical beadboard panels that go from floor to ceiling can look very charming in a bathroom, especially one with a modern vibe like this one customized by Artistic Designs For Living. The width and length of the panels dictate a modern design with just a hint of retro charm. 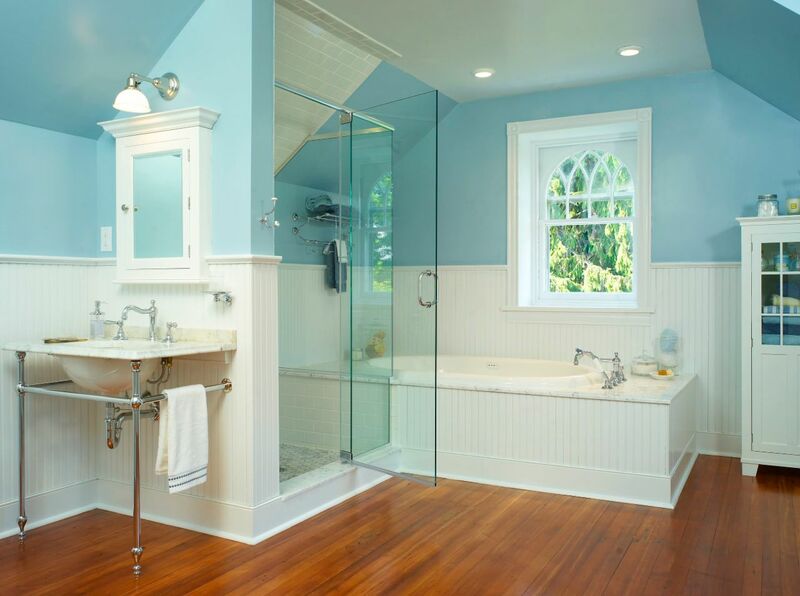 Beadboard panels are a special alternative to wall tiles and can also be used to frame all sorts of things such as the bathtub, shower or vanity. 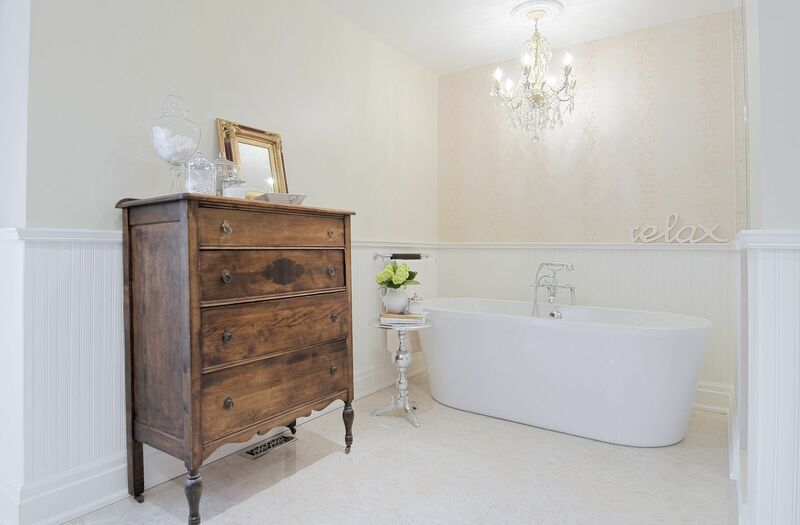 This chic and elegant bathroom combines elements of the Victorian style with modern features and the result is a simple yet sophisticated design. In addition to looking elegant and a bit retro, beadboard wall treatments are also quite practical, especially in bathrooms where they protect the walls from excess moisture or water damage. They’re also easy to clean and to replace if required. 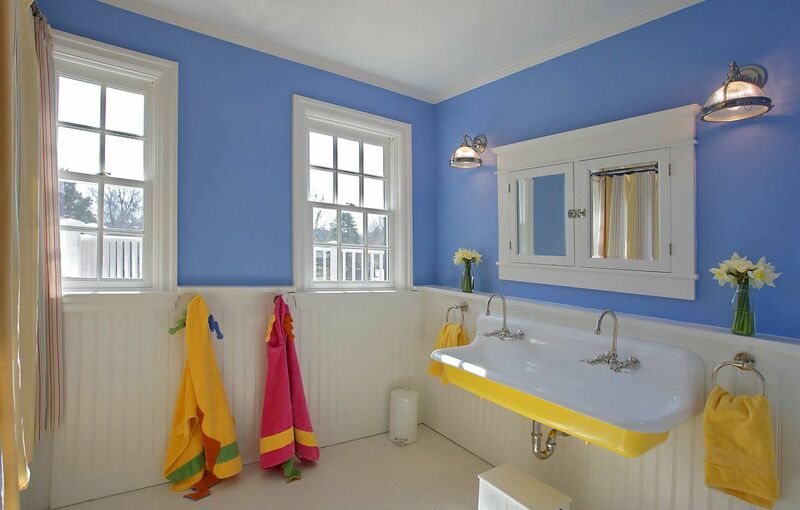 The role of the beadboard wall treatments in this bathroom is to offer insulation and protection but also visual interest to the space by contrasting with the upper wall section which in this case is painted in a bright blue tone. At the same time, the wooden panels unify the space in a very pleasant manner. 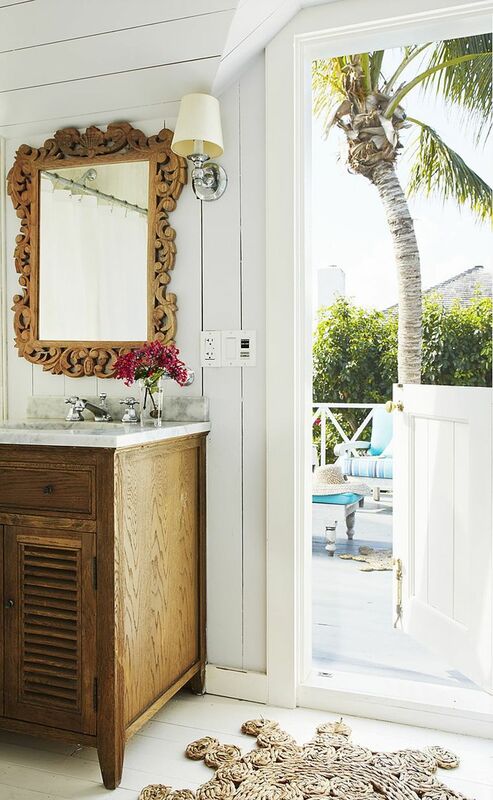 How chic and charming is this beach cottage? It was designed by Liz Strong and it looks very fresh but also very welcoming thanks to carefully-selected interior design details such as the beadboard bathroom walls, the ornate mirror frame or even that cute little wall sconce in the corner. Whether it’s wainscoting or a beadboard wall treatment, the visual impact is quite similar on the interior design of a bathroom. 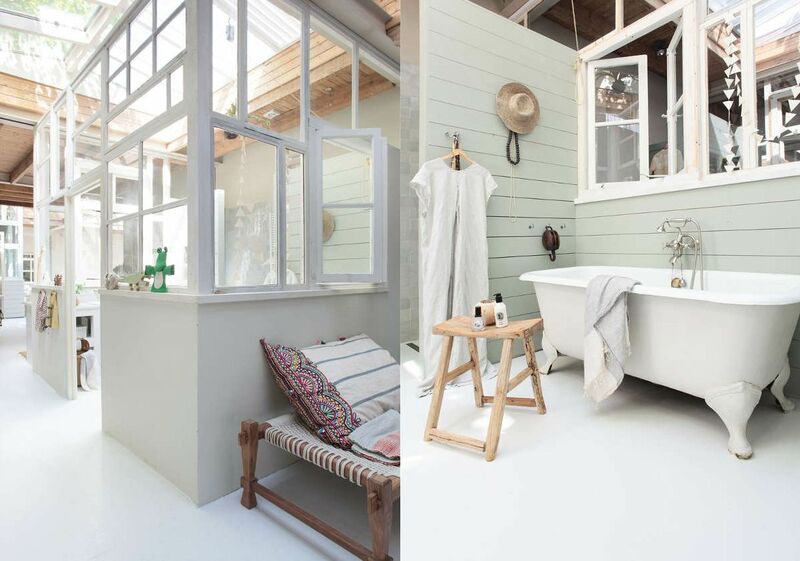 Both options give the room a welcoming and cozy look and are suitable for bathrooms with freestanding tubs as they offer protection for the walls. A lot of times the bathroom is packed with furniture and fixtures so there’s much empty wall surface that’s visible throughout the space. Adding beadboard panels in such a case would only make the room feel more cluttered and tiny so we’d say this design detail is more suitable for bathrooms like this one where the walls are visible and open. 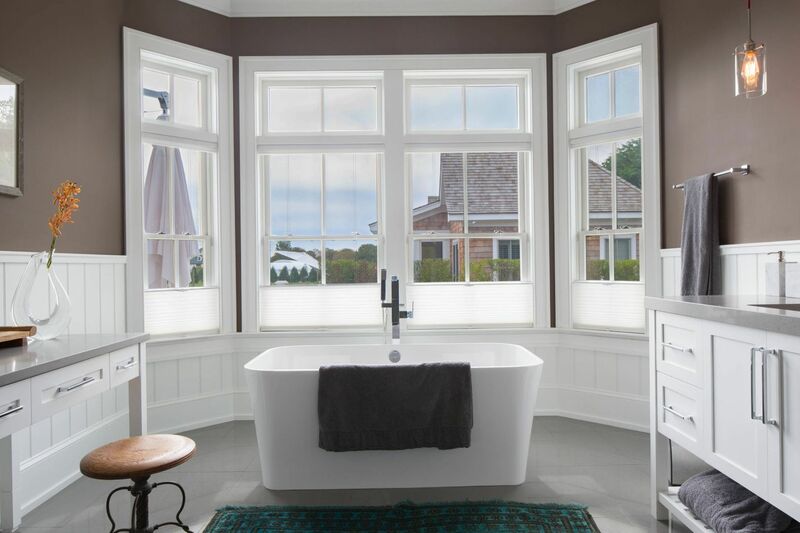 Since you can install beadboard panels on walls at any height, it’s up to you to decide the proportions based on your bathroom furniture and fixtures. You might choose to align the panels with the window frames or with a cabinet. You might also choose to mix and match different proportions. 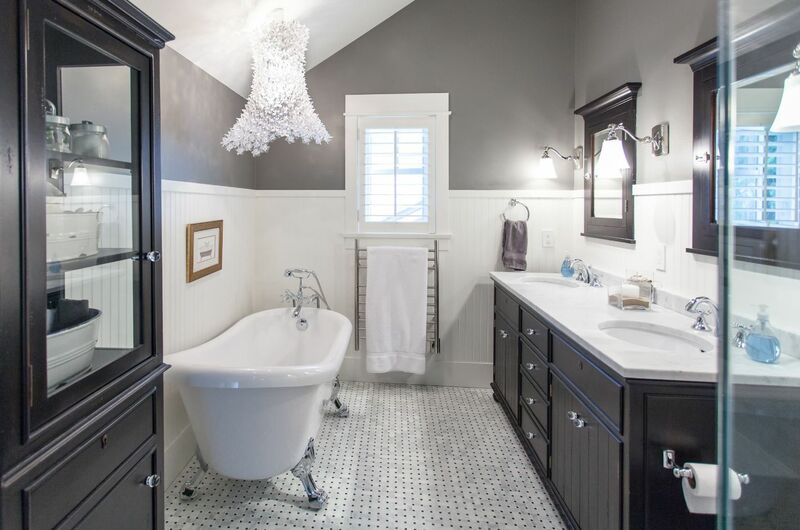 In the context of this classy and elegant bathroom, the beadboard walls help to add visual interest to the space and to make the room feel more warm and welcoming. Considering how open and airy it feels, I’d say this was a very successful choice of style. In some cases, beadboard bathroom walls can help to brighten up the space and to give it an organized and symmetrical look. 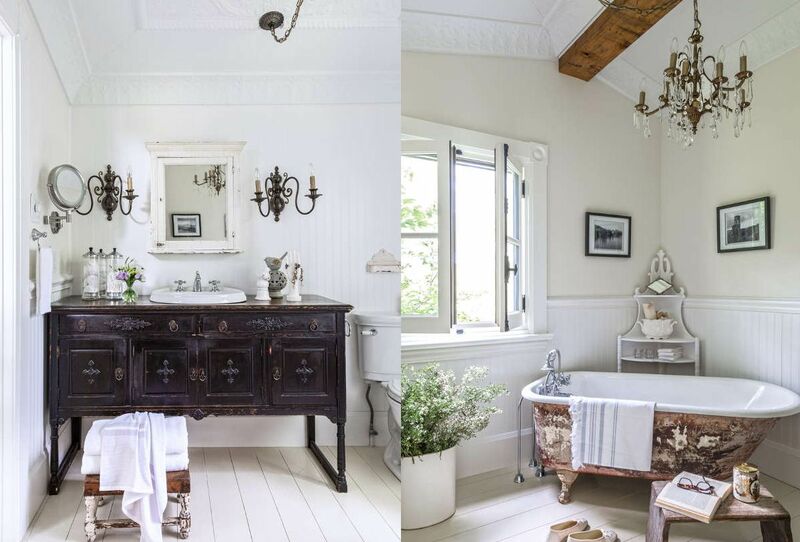 This traditional bathroom is a perfect example in this case. The post How Beadboard Bathroom Walls Can Make This Space Feel Welcoming appeared first on Home Decorating Trends – Homedit. ← I’m Tired. I’m Frustrated. And I Want To Walk Away.